Convenience of use and playback performance are the main considerations that pointed my attention toward the idea of buying a dedicated network player to replace the PC I have already in use. After researching the market for an affordable device that can stream digital audio over network or attached via USB data storage device my choice was basically reduced to two contenders – Auralic Aries Mini and SOtM sMS-200 both priced bellow 600 euro. I decided to give SOtM a try because of seemingly better build quality and the versatility of use. For those of you that have no idea what a network player is I’ll explain in short: Network player or streamer is a digital transport similar to CD player which instead of having a slot where a record could be put has network connection interface (RJ45 Gigabit Ethernet or WiFi connection) so that it could become part of the local network. This means that other device like PC or smartphone which is also connected to the same network could be used as remote control. Imagine you are seating on the sofa with your smartphone or tablet in hand and all you need to do is to start the control application, pick an album and press the “Play” button. Network player can transport not only locally available audio data stored on a NAS server or Hard Drive / USB stick, but also from located in internet services like Quobuz, Tidal, Spotify, TuneIn and so on. PC could also be configured to be used as a network player in the same manner and remotely controlled via smart device. The enclosure of SOtM sMS-200 is made of metal rather than plastic which is the case by Auralic Aries Mini. The software variety and versatility of use by SOtM is also outperforming Auralic which is restricted to be used only with its proprietary software (AURALiC Lightning Server). With Auralic Aries Mini one have only one playback control application available (AURALiC Lightning DS) to run on his smartphone or other iOS smart device. What I liked about SOtM is the variety of possibilities it provides at nearly the same price. It has a set of software applications installed including Roon Client, HQ Player, Logitech Media Server (LMS) with SqueezeLite Client, Music Player Daemon (MPD), DLNA Renderer, Shairport and lightweight Web Server. On the application market there are dozens of applications available that could be used to remotely control the playback. 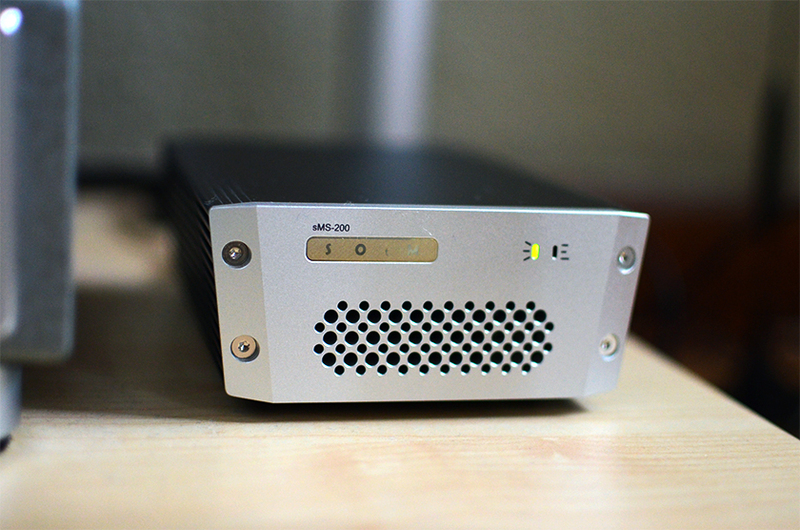 At the same time Auralic has integrated DAC so that it can be coupled through its analog outputs directly to an amplifier. So basically it is an all-in-one solution that gives the user straightforward possibilities for use as a digital transport. Therefore it targets not so demanding users and could save money that otherwise should be spent on a separate DAC. 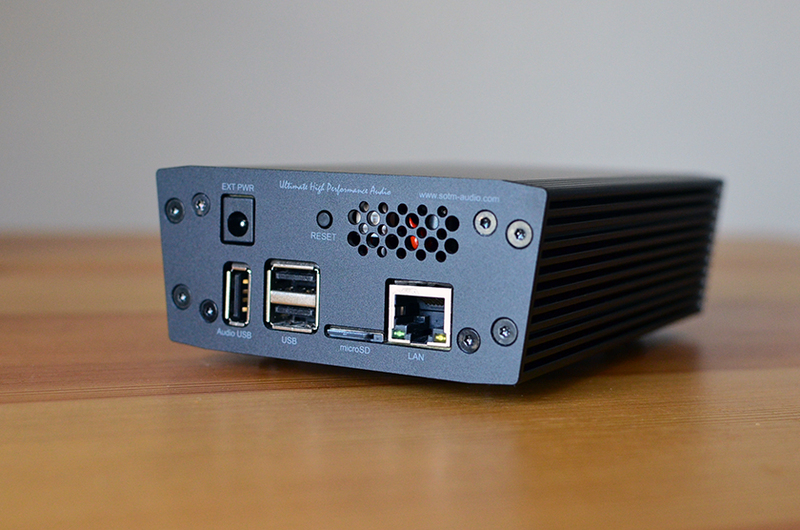 It is restricting in terms of software but versatile in terms of hardware for it has variety of connectivity options – USB, Coaxial, TOSLINK digital outputs plus analog cinch outputs. SOtM is restrictive in terms of hardware for it gives the user only one connectivity option — digital USB output, but versatile in terms of software. Before I got the SOtM sMS-200 I used my PC as a digital transport in conjunction with my iPod Touch as control centre. At the beginning I used the famous foobar2000 media player software on my PC with MonkeyMote remote control app running on my iPod. I was able to play audio files stored on my PC and remotely control the playback. After some research I become aware of the existence of Logitech Media Server (LMS) software that could also be installed on PC end expand its functionality by adding capabilities of streaming through internet based services like Quobuz, Tidal, Spotify and so on. So I gave LMS a try and I was literally blown away by this software. It has completely transformed my PC, not just by means of convenience and versatility but mainly because of the superb playback quality. Shortly before my discovery of LMS I was considering switching to all analog transport using turntable and phono preamp but I was not willing only because my believe that proper digital transport could deliver a sound very close to the analog one, giving you on top the flexibility that analog could not. In spite of having a high quality non-over-sampling (NOS) DAC, the combination of PC running Windows 7 + foobar2000 software didn’t came anywhere close to the relaxed and earthy presentation of a pure analog transport. All this have changed after installing LMS. I was listening to music again, I was immersed in its organic flow forgetting myself completely. One cannot believe until he tries, what a great change a software could bring. I consider the switching to LMS as one of the most positive influences on my audio system ever. Still using a PC or Notebook is not very convenient and it has his caveats. The main drawbacks of the PC is that it produces acoustical noise, it is big and one need some peripheral devices like keyboard and monitor. The other weak point of using PC as a digital transport is that the parts used in an average computer are not of a high, audio grade quality which means that electromagnetic interference could cause pollution of the signal resulting in induced jitter. So after sorting out the software the next logical step was to find a proper hardware. Being aware of what a big difference a software could bring in the system’s performance I was not willing to limit the system’s performance by bringing device that relies on a single proprietary software. Despite all the efforts to boost the PC performance by trying different audio device drivers like WASAPI, ASIO and Kernel Streaming under Windows 7 operating system, before adopting LMS I was able to discern the typical for digital audio reproduction artificial glare and listening fatigue. One can access the web interface of SOtM sMS-200 by entering http://localhost/eunhasu in a browser from any connected to the local network device. With SOtM sMS-200 utilising LMS as a playback software the music listening became even more relaxed experience. It is a fan-less device that lacks any noise, the musical background is completely silent as well. All aspects of the audio reproduction have been improved in comparison with my PC. The manufacturer and several reviewers are claiming that its performance could be further improved by using the optional battery power supply mBPS-d2s which I find a bit expensive at the moment, but I am willing to test at some point. I am currently using iPeng 9 application on my iPod Touch in conjunction with SqueezeLite and LMS running on SOtM sMS-200 to remotely control the playback and I am pretty happy. iPeng 9 iOS app runs as honey on butter — sleek, fast and responsive and it gives me access to features like song lyric, artist and album info, playback quality and so on. It is not free though, but the user experience it delivers is times higher than the one you get from free apps like the ancient Logitech Squeezebox Controller. That’s it for now dear fellows, I’ll keep you informed about my further explorations on that topic. What I can draw as a conclusion is that SOtM sMS-200 compact network streamer is a device of high quality that delivers extraordinary performance for the bucks and can be used in variety of ways. If you are considering such a device you will do no wrong giving it a try. I just came across your blog in my research of the sms-200. 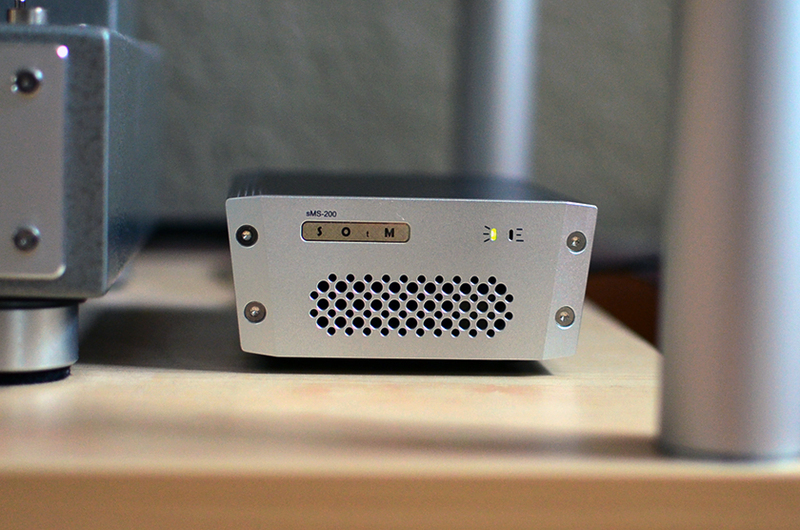 Im interested in moving away from my Mac mini music server to the sms-200. Im still a little confused about the playback process. Is the playback software running on the sms-200 or do I need a dedicated PC to host and playback files? I’m hoping I can attach a USB HDD (w/ music library) to a router and be set. sms-200 is a great device that brings substantial benefits in both convenience and quality over the default Mac/PC solution. It hosts all the software required and you only need a computer or a mobile device to control the playback. You can attach USB HDD or any storage device directly to sms-200 so no router/server required. You can use local NAS server if you like but that is not required. I am using my Sony NWZ-A15 portable player with a 256GB microSD card as a storage which is attached directly to sms-200 via USB interface. But mainly I am streaming CD-quality music directly from internet (you have many options there), a feature very well implemented in the LMS software package that comes pre-installed. I would advice you to replace the stock DC-power supply of the SoTM with some of a higher quality. I am using iFi iPower supply with active noise cancellation and the improvement is noticeable. Nice review! Can I ask you to give some details about ipeng9 and how it works with lms that comes “pre installed” on sms200’s eunhasu software? I just spent several hours working out how to stop lms from providing dual tracks on each of my ripped albums. Quite a wrestle! How does ipeng help you in using lms? I don’t have much experience with all this software, e.g., MinimServer, bubbleupnp, lms, ipeng, mpd, Soundirock (which apparently won’t work with 2qute because it’s dop did). I agree on nice sound quality. I use ssd in USB drive plugged directly into SMS200 supplying chord 2qute. Hi Ben, thanks for asking this question. iPeng 9 is just a remote control app for the Logitech’s Squeezebox. So if you want to use iPeng 9 to browse through your music library and control the playback you should first activate the Squeezelite by using the web interface of your local Eunhasu instance that could be reached at the address http://eunhasu. After the Squeezelite – a software that allows you to play music streamed from Logitech Media Server – is being activated you are able to connect iPeng 9 that runs on your mobile device with the instance of Squeezelite running on your sms-200. 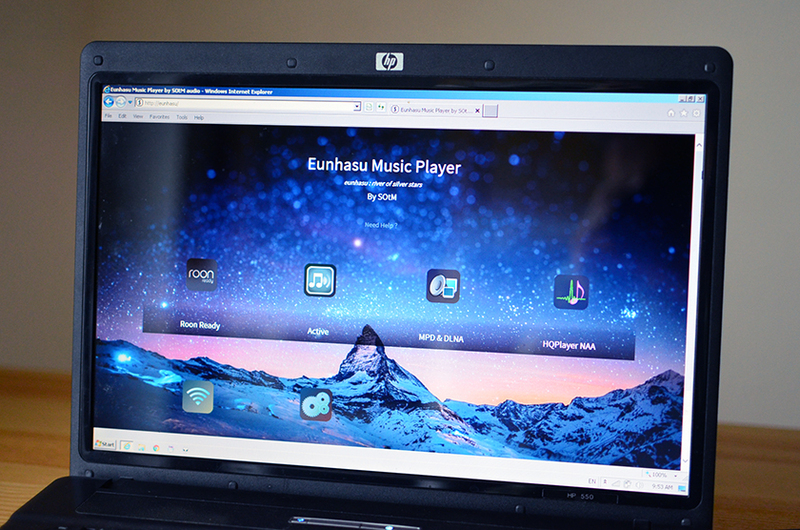 From the Eunhasu web interface you are also able to enter the settings page of the LMS and to trigger library rescan that should sort out your dual tracks problem, library rescan could be also triggered from iPeng 9 and this is useful whenever you add new music files to your local storage.